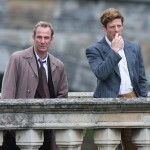 Home » Mystery » First look at ‘Grantchester’ S2, returning tonight on ITV with PBS not too far behind! 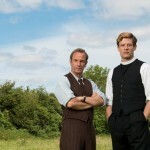 First look at ‘Grantchester’ S2, returning tonight on ITV with PBS not too far behind! Heads up, Grantchester fanatics! 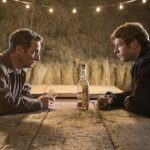 James Norton (Happy Valley, War and Peace) reprises his role as Sidney Chambers, the charismatic, charming, crime-fighting clergyman, and Robson Green (Touching Evil, Strikeback, Wire In The Blood) returns as his partner in crime, Detective Inspector Geordie Keating, when the second series of Grantchester begins tonight at 9:00p on ITV. 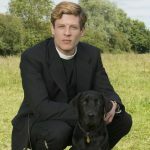 Not to worry U.S. Grantchester fans, the second series is not too far behind with the premiere episode scheduled to transmit on PBS, Sunday, March 27, 2016 at 9:00p ET/8:00p CT. When series 2 begins tonight, it’s 1954 and just outside the Cambridgeshire village of Grantchester, local vicar Sidney Chambers [Norton] is enjoying a glorious picnic with his best friend, DI Geordie Keating [Green], Geordie’s family, Sidney’s shy curate Leonard Finch [Al Weaver] and their grumpy housekeeper Mrs Maguire [Tessa Peake-Jones]. Walking home, their happy day is cut short when DC Phil Wilkinson [Lorne Macfadyen] arrests Sidney and the charge is…sexual assault. Speaking of “the scene” above in which the two Grantchester stars appear shirtless following a quick dip in the opening minutes of episode 1, Norton laughed it off saying, “That Poldark shot made me feel incredibly inadequate and emasculated. I can’t deny that Robson and I were in the gym doing press-ups the night before we shot that scene. Of course we were! We were freaking out thinking, ‘oh god, ten million people are going to be watching us in our swimming trunks”. Without giving too much away, let’s just say that in the subsequent 50+minutes, there’s an accusation, a missing girl and a misunderstood girl. Unfortunately, will the answer this and a number of other questions in tonights premiere may just damage the unlikely crime-fighing duo friendship forever? 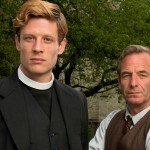 ‘Grantchester’ returns to PBS’ Drama Sundays this week!